Hello Friends! It has been 3 weeks since my last Post and I apologize for the hiatus. When I write my Posts and I go back and read them, I realize that sometimes when I write, I am writing for myself. In the past few weeks It seems that I have been so busy with the responsibilities of work, family, selling my home and preparing to move, Church related activities, as well as the daily challenges that seem to come up out of nowhere that sometimes I feel like I’m riding on ‘E’! I know someone can relate out there. 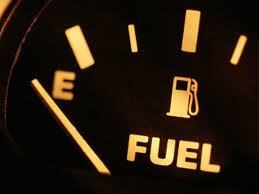 You see I am no stranger to riding with my gas tank on ‘E’ as I drive on average just under a thousand miles a week. At times when I am “financially challenged”, I can tell you that it can be a stressful feeling when you HAVE to be someplace and you are riding on E. The newer cars today have a Range meter that will tell you exactly how many miles you can drive until you are empty. (How I could have used that option years ago). My niece calls it riding on Excitement, Some say Riding on Fumes, Riding on Hope, etc. In all honesty, I have found myself riding on Spiritual Fumes lately. I have had to follow my own advice and “Be Still” sometimes, or Do Not Worry About Tomorrow . My gas light has been on, my miles to empty have been in the single digits, some days I sputter but I thank God that I have my Heavenly Debit Card and that I have been able to fill my tank on the Word of God in order to make it to my destination. Friends we need to cling to the Lord when we get overwhelmed, trust that he won’t let us run out of gas, we need to pray with out ceasing, we need to fill our Spiritual gas tanks with the Holy Spirit. We need constant communication with the Lord, We need to study of the Word, and above all trust Him in all things. Reading these verses over the past few weeks have kept me from running out of gas when I was riding on ‘E’. Remember that we are never alone in our trials and we just need to cast our burdens on Him and have the faith of a mustard seed. As always brothers and sisters, be encouraged and not discouraged. Remember Proverbs 3:6 – In all thy ways acknowledge him, and he shall direct thy paths. I won’t…you inspire me! Thanks for the Well wishes and thinking of me during this holiday season. God Bless YOU and Merry Christmas to you too!